Buy a light. Be a light. Find the perfect GoodBulb, build a brighter world. See how you help others. More lightbulbs than you can imagine. Start shoppin’ for light. 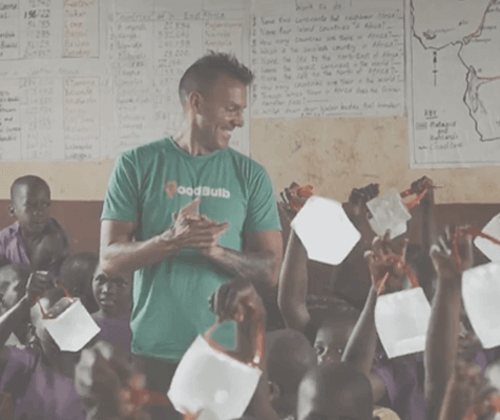 GoodBulb was launched in 2015 with a simple foundation: Be Good. We believe every founder, customer, and organization — in any industry — has an opportunity to use their decisions for good. Our commitment is to use our expertise in lighting to provide Good Savings, Good Education, and Good Causes both locally and around the world. If you’re not completely satisfied with our service and products, we’ll gladly refund your purchase. Goodbulb rocks! Always super helpful and sometimes the super friendly office puppydog is there. Good customer service and friendly dogs gets 5 stars from me. Much cheaper than when purchased at a retail store! Excellent customer service! I feel like this business really cares about me. Highly recommend! GoodBulb actively partners with non-profits around the globe to provide sustainable light to places without electricity. With your help, we have distributed thousands of solar lanterns to families in remote villages. Watch how your light gets put to work, here. you’re spreading light around the globe.